Don’t you just want to pet it?!? Mondo swarmed today. Finally. 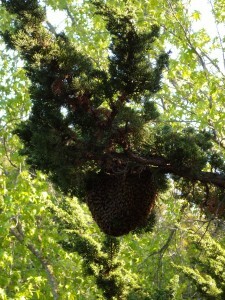 Nearly a month later than last year’s first swarm. A big, beautiful, humming ball of bees. 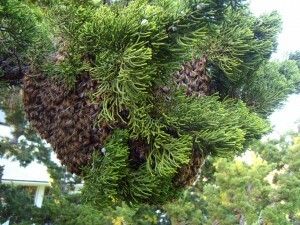 My brother, who happens to be one of our neighbors, called Kelly in a panic to report that there were “swarms of bees everywhere.” By the time I got home from work hours later, the bees had formed a cluster the size of a five-gallon bucket and hung from one of the highest branches of a juniper tree. Great. 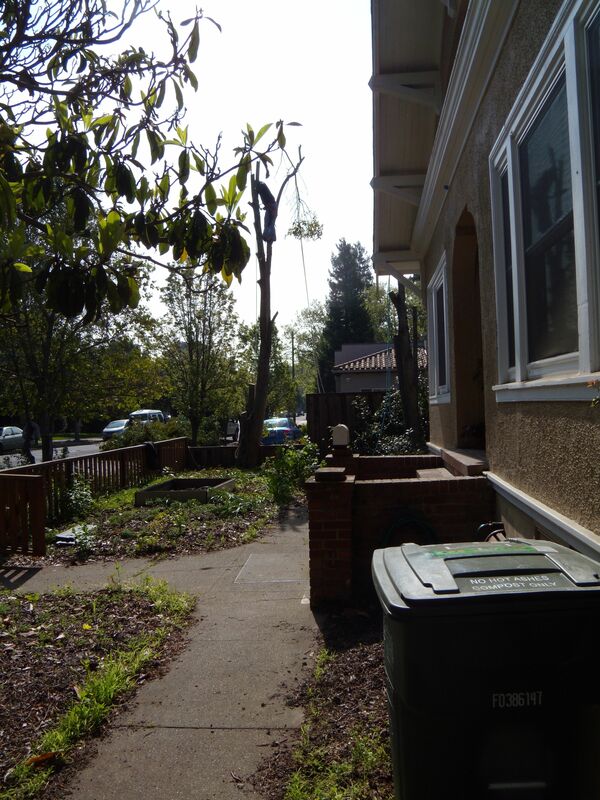 We spent the better part of an hour maneuvering our extension ladder between branches. Then I suited up and climbed within reach of the swarm. I can’t get over bees. I can’t stop being in awe of them. 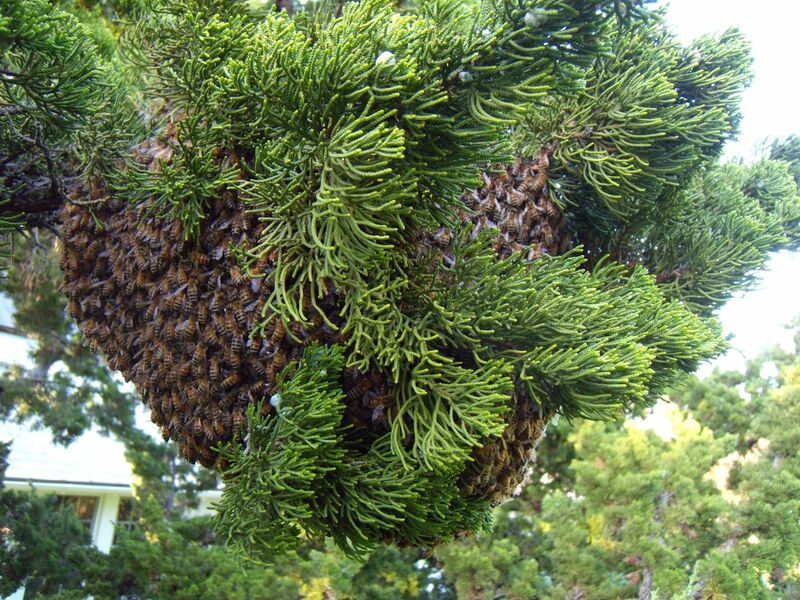 Here are Mondo’s bees – thousands of them – setting out to find a new home. How did they ever learn to work so perfectly together as one cohesive mass of vibrating insects? At any rate, after I had gazed at them and snapped half a dozen pictures from the top of my swaying extension ladder, I got down to business. 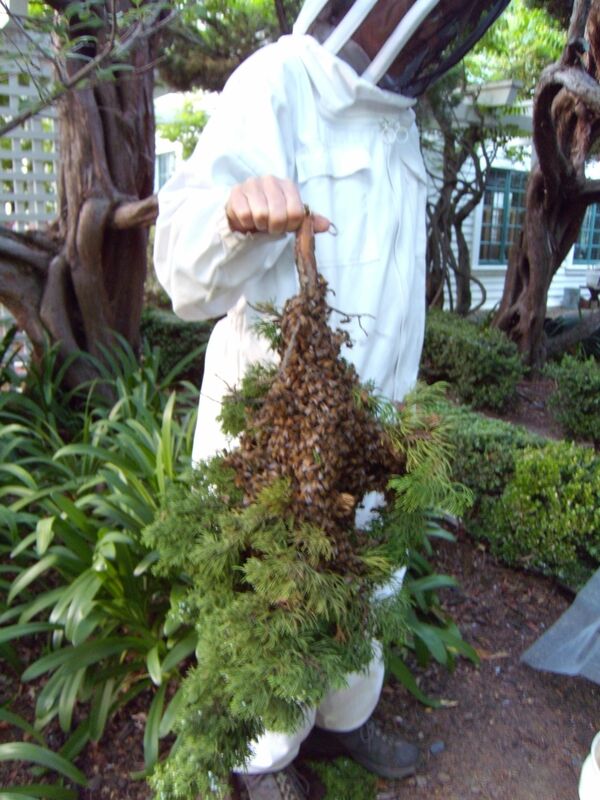 I carried up a five-gallon bucket and carefully brought it underneath the cluster of bees. Holding onto the bucket with my right hand, I took the branch firmly in my left hand and gave it a hard shake. There were still bees on the branch, so I repeated this shake several times. 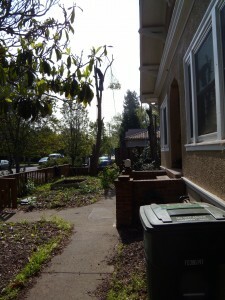 Then I balanced the bucket on a branch and covered the top with soft window screen. I secured this over the top of the bucket with a bungee cord. Turns out it’s pretty tricky to shake all the bees out of juniper foliage, so I trotted down the swaying ladder, handed off the bucket to Kelly, and climbed back up. Ultimately, I sawed off the end of the branch the bees had hung from and took the whole thing with me. We hived the bees back at our house, just before dark. As of this writing, we have not yet been able to put the lid on the hive because there are so many dang bees everywhere. A terrible dusky picture of the bees immediately post hiving. Now we wait and see if the swarm had multiple queens (multi-queen swarms are Mondo’s specialty). If it does, sub-groups of bees may decide to take off tomorrow. 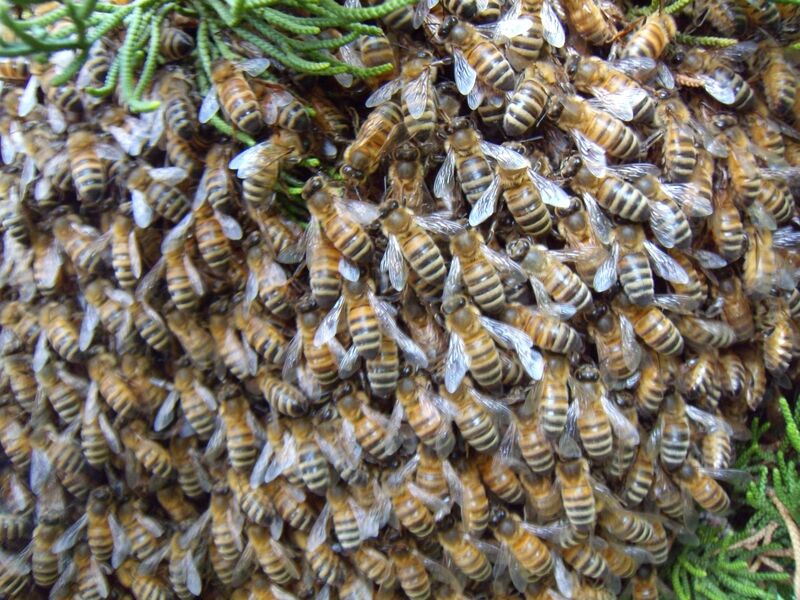 We suspect that this was a primary swarm (the old queen leaving the hive, while the remaining bees in Mondo raise new virgin queens). Still, we wouldn’t put a multi-queen swarm past this group. Stay tuned. Despite my best intentions, life has prevented me from writing a follow up about our first hive split until now. There’s been plenty of drama and uncertainty along the way, but a recap of the timeline of events will have to suffice. Be warned: the following is kind of geeky and detailed. March 26th: a mating flight? 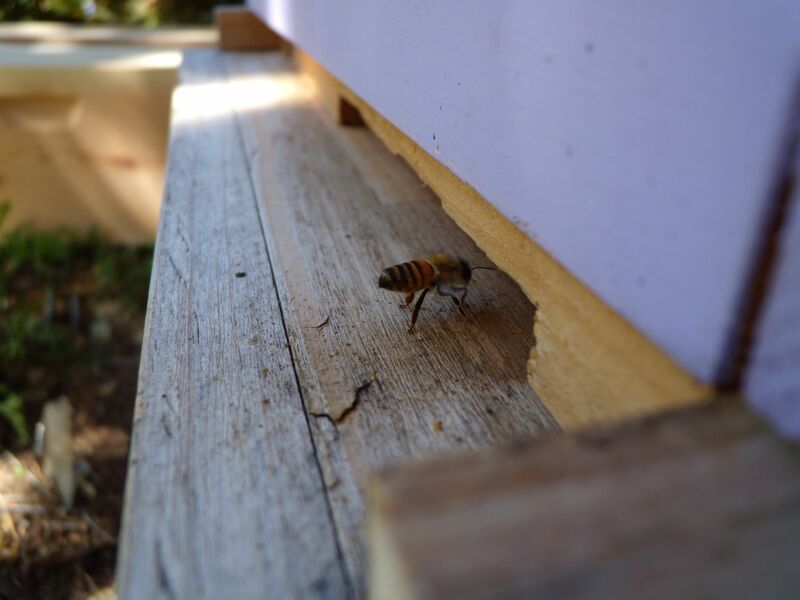 The host of our first split emailed to let us know that the original hive has seen a huge decrease in activity and that only an occasional bee exits or returns to the split. I dropped by after work to take a look, wondering if the main hive swarmed (it did, after all, have oodles of queen cells leftover after splitting). It was around 5:30 when I arrived, and the afternoon was cooling off. There seemed to me to be a perfectly respectable stream of bees coming and going at the main hive’s entrance. As luck would have it, the hosts were home and came rushing out to tell me the latest news. They reported that both the hive and the split had been extremely active through the afternoon and that they had been particularly impressed by the large number of bees flying around the front of the split. Kelly tells me that, according to The Buzz About Bees, workers often engage in mass orientation flights when a virgin queen goes out to mate. Could it be that this was that most auspicious day? Our helpful hive hosts called around 2:00 to report that hundreds (thousands?!) of bees were hanging off the front of the original hive. Kelly packed up equipment and sped to the site, only to find that the bees seemed back to normal. 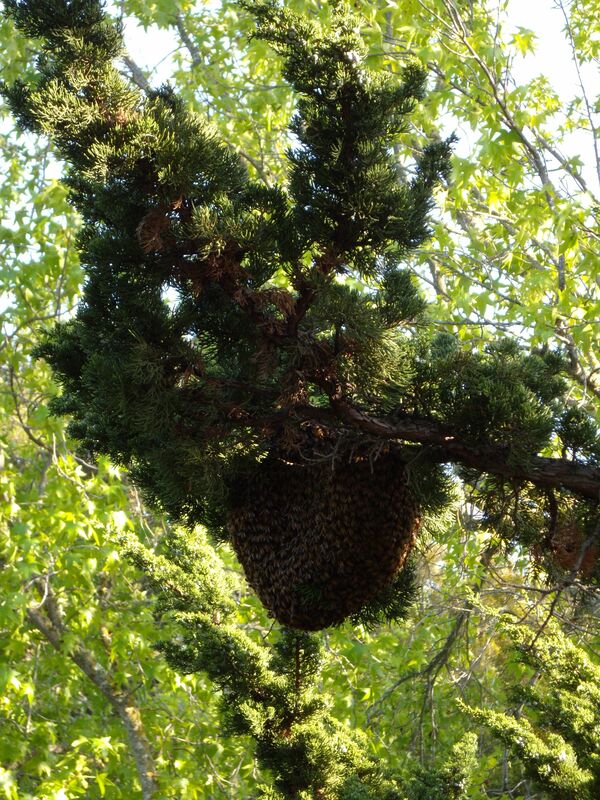 The question remains whether the swarm took off into the neighborhood before she arrived, or changed course and went back into the hive. We have witnessed this change of plans with other colonies. Unfortunately, the hosts hadn’t stuck around to watch after their phone call, so there’s no way to know for sure. April 3rd: a tiny swarm or a botched mating flight? We received another call from our unflappable hive hosts. 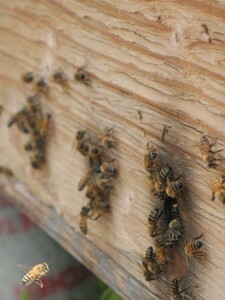 They reported that another group of bees, smaller this time, was hanging off the front of the original hive. 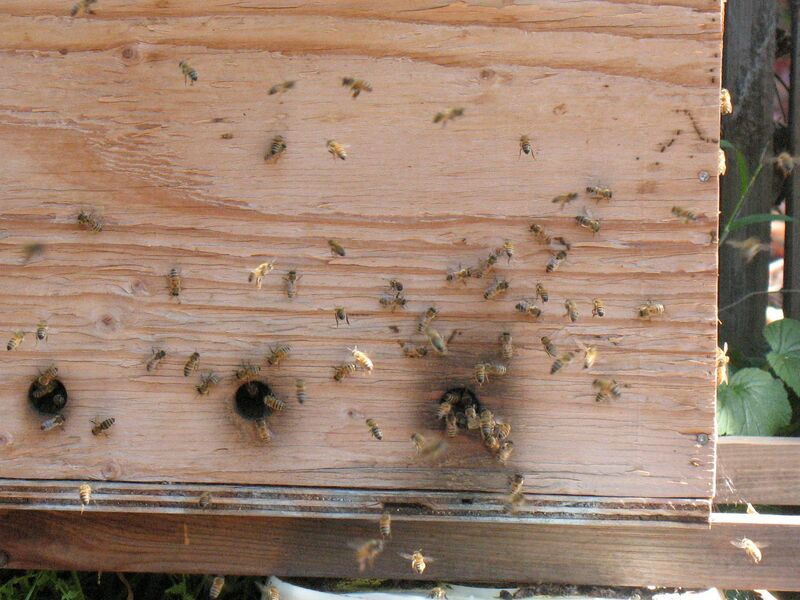 When next they ventured to the window, our hosts found that the group was now milling about on one of the hive stand boards and that there were significantly more bees than usual on the ground beneath the hive. An hour later, when I got the message and called them back, the bees had once again dispersed. Whether they returned to the hive, or took off, was again uncertain. The host estimated that the group of bees had been about the size of a baseball. Tiny. The small size of the cluster and the large number of bees on the ground made us wonder if this was a botched mating flight for a virgin queen with bad wings. We began to fear that our clumsy handling of the capped queen cells present in the hive when we split it might have led to unborn queens falling on their heads and developing improperly. No joke. Queen bee pupae are susceptible to this type of injury for the first two days after the queen cells are capped. 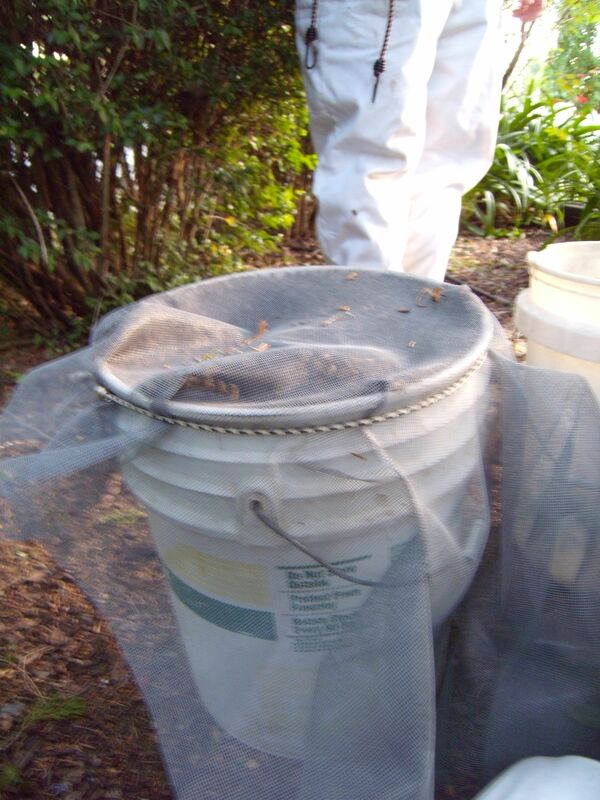 Plagued with concern, we decided to inspect both hives to look for queens and brood. The original hive has four boxes. When we split this hive on March 17th, the brood nest was in the middle two boxes, and the bottom box was mostly empty. 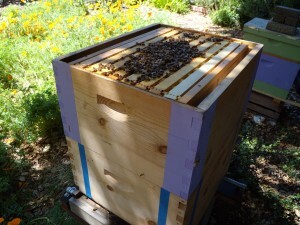 We added the fourth box that day to allow room for the bees to cure nectar, should they so desire. For this first post-split inspection, Kelly and I went through the top two boxes and found that the bees were busy curing nectar. We found no brood and no queen. We judged the bees to be slightly “edgy.” We also found two supersedure cells on a frame in the second box from the top, but the bees seemed to be ignoring them, leading us to surmise that the cells were not viable. We saw no pollen coming in on foragers’ legs. We found no brood in the little split, but we judged the bees to be less edgy, and we were heartened by their foraging and nectar curing. I returned this past Friday with the intention of finding evidence of a laying queen in the original hive, or recombining the hives. I went straight to the middle frames of the top two boxes on the original hive, again finding only curing honey. In the second box from the bottom, I found the queen on the first frame I pulled. No one seemed to be paying much attention to her, and I resolved to watch her until she laid an egg. This took a while. Eventually, she dipped her tail into a cell and then moved on. I squinted with all my might, but couldn’t see an egg. Then I watched her stick her tail deep into a cell. She took her time with this one, and the surrounding bees seemed to perk up and pay attention. Unfortunately, again, I was not able to see an egg. A beekeeping acquaintance told me recently that you can tell how old an egg is by its angle in the cell; a newly laid egg stands up straight, while a one or two day old egg begins to tilt, until it is lying down on the bottom of the cell. If this is true, maybe I couldn’t see the eggs because of their angle? I returned the frame with the queen and looked at the next one over. And there, joy of great joys, I found a full frame of the cutest little larvae I’ve ever seen in the daintiest worker bee comb (no drone layer here, thanks very much). 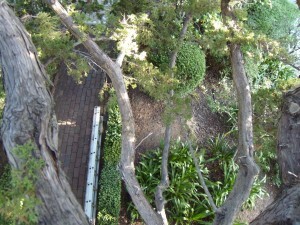 On top of the brood nest. The bees also seemed less edgy to me, for what it’s worth, and the workers were bringing in plenty of pollen. Unfortunately, the small split seemed very much the same as the week before. The bees are bringing in pollen, and they’ve arranged tidy arches of bee bread under the capped honey at the top of each frame. They fanned with gusto at the entrance and on some of the frames as I inspected, but I could not find any sign of the queen. The last remaining fanner after the inspection. We will return this weekend to inspect a final time before deciding whether to provide this small group with eggs to raise another queen. The deed is done. 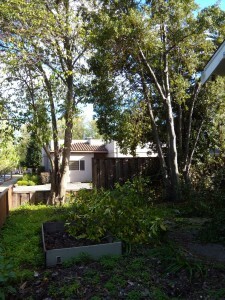 A crew of talented tree-removers cut down four privets, a palm, and a huge laurel, in our garden and parking strip. 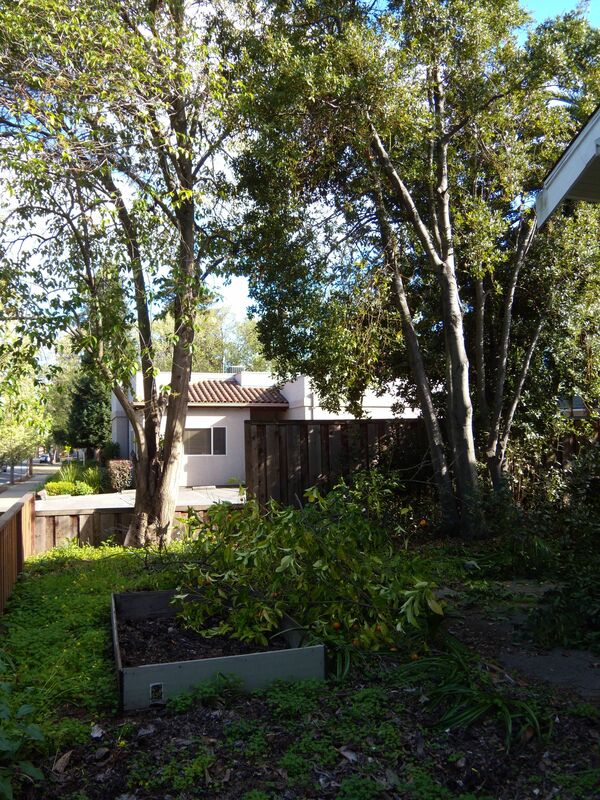 For all my recent talk of concern over (temporary) loss of bird and critter habitat, I couldn’t be more pleased with our newfound sunshine. 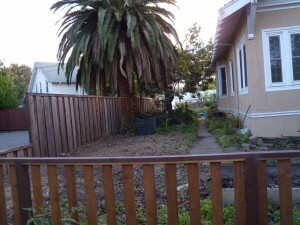 The front yard and the east side-yard are now in full sun through the morning and part of the afternoon. 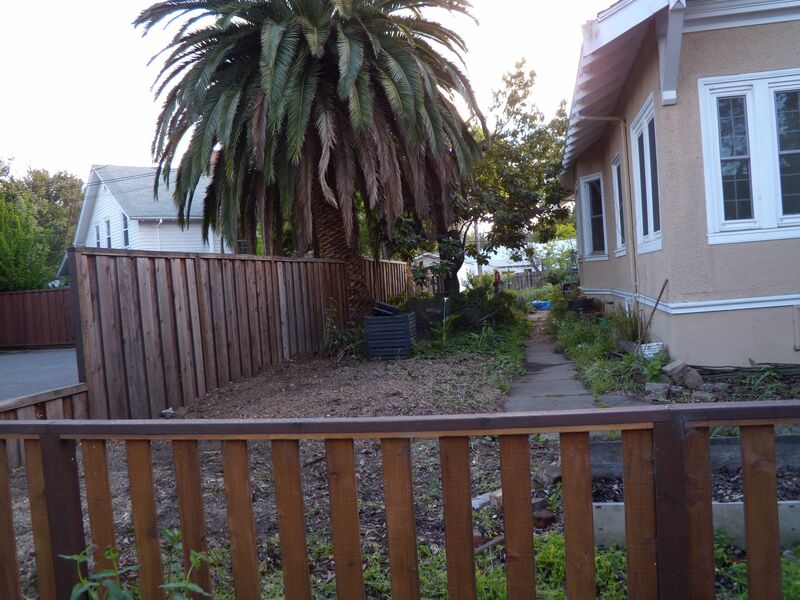 Questions remain: what should we plant, and how can we really get rid of the abundant Bermuda grass, without chemicals? 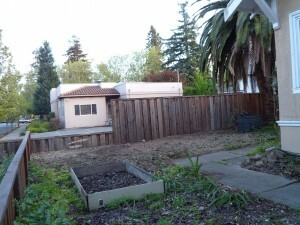 I see long, backbreaking hours of shoveling and archeology-style weed removal in my future. 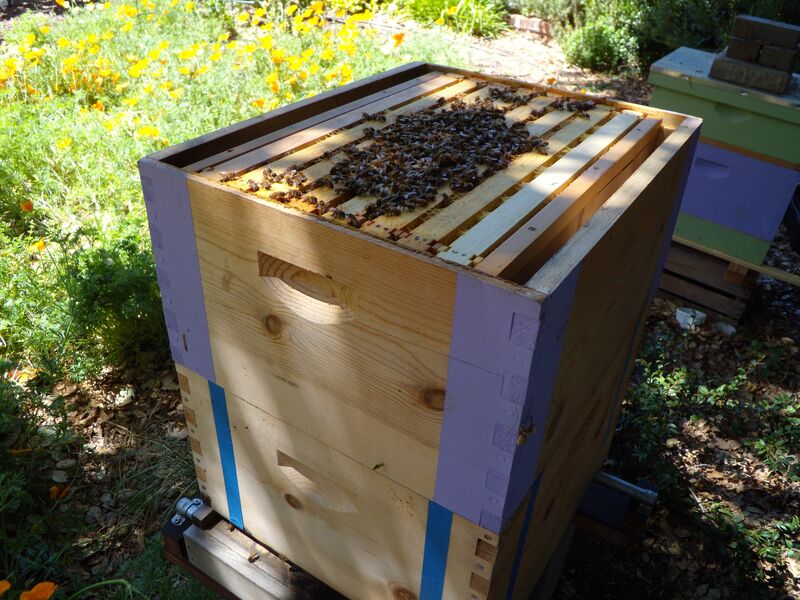 Our top-bar hive, Mondo, is going into her third year. In the past two weeks, we have witnessed several mass orientation flights beginning at about 3:00 in the afternoons. We always call these ‘hatch-outs,’ as if a new generation of bees within the hive has emerged, thus graduating older bees to the status of foragers. These newly minted foragers must first orient to the hive to mark their place in the world. The truth is, we’re not really sure that’s what’s happening. Sometimes we’re positive they’re about to swarm. Then again, mass orientation flights can disguise a virgin queen who is orienting before she goes out on a mating flight. In any case, it’s always exciting to watch. And it’s loud! As we think about propagating our hives, we consider bee genetics, as expressed by their desirable and undesirable traits. Mondo has lived two years without treatment for diseases or pests, including Varroa mites, but that is about all we know, since I won’t let Sarah work the hive. 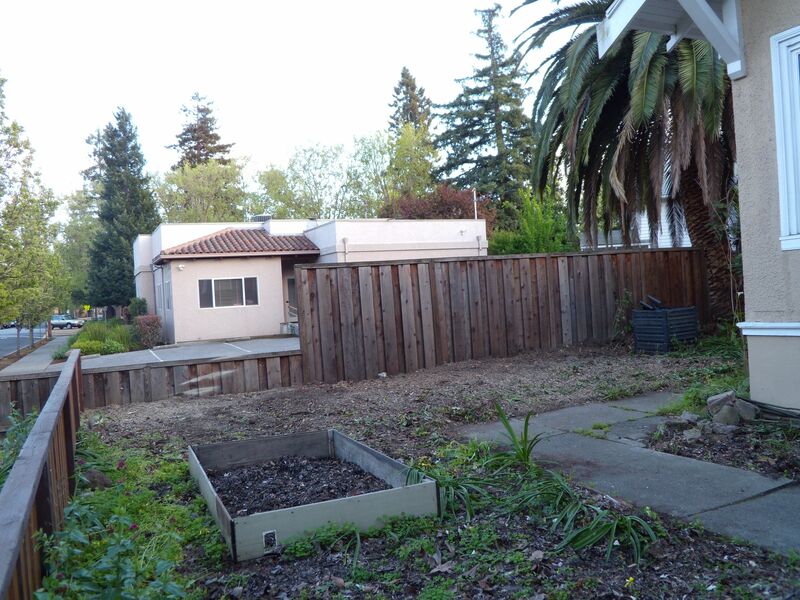 Their home is a hastily built top-bar hive, rectangular and too deep. 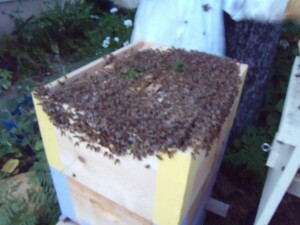 The bees have cross-combed between bars and attached comb to the sides of the box. The few times we’ve gone in, we’ve done a lot of damage. We assume she’s a good honey-producer, since Dave, a direct progeny, was, and her bees are mostly mellow. This last trait, however, seems to be contingent on what’s happening in the hive. When I looked up into the hive several weeks ago, she seemed agitated and as I took photos yesterday, wearing my black vest, I received buzz-bys of various comment: back off, or, who are you?, or, get out of my way. Many researchers now acknowledge that part of honey bees’ struggles results from their limited genetic make-up. Of the more than 24 recognized honey bee subspecies in the world, honey bees in the U.S. derive primarily from the Carniolan and Italian subspecies. Add that to the practice among queen breeders of instrumental insemination (vs. open mating) and you end up with a pretty limited gene pool. And limited genetics make for a limited ability to respond behaviorally or physiologically to challenges, such as pests, diseases, or a changing environment. To some degree, honey bees are a domesticated animal. When we select for certain attributes, we inadvertently select for others, and deselect yet others. Mondo and her progeny seem driven to produce great quantities of queen cells, certainly more than I’ve read about in most literature or heard fellow beekeepers describe. Further, her virgin queens seem to prefer sorting things out after swarming, whereas most literature cites this sorting out as occurring before swarming. The swarm that became Mondo contained around 10 queens; Dave’s swarm had four that we counted; Hortensia had six, but a large subgroup departed the day after we hived them. From a colony’s perspective, this behavior may be critical to creating, and testing, the mettle of new queens. But to a suburban beekeeper, these multi-queen swarms provoke ambivalence, especially as one hives a swarm for the second or third time. But we’re still not sure why Mondo has lived for two years. Does she have ‘hygienic’ behavior, curtailing the spread of mites? Is it that we’re not in the hive disrupting things several times a year? Is it that we’re not taking honey? Is it the hive she’s made her home, spacious, with plenty of air circulation? Does she harbor two laying queens – not unheard of in large colonies – and thus have a back-up? Do her progeny colonies retain two queens? The scientists, or lay scientists among us could probably sort it out, beginning with the most basic of observations from a monitoring board, and gradually moving their focus from inside the hive to inside the bees. While working in a psych lab in college, where we starved rats to 2/3 their normal body weight so that they would be ‘motivated’ by food in various experiments, I decided that observation might be the most powerful tool with which to learn. Observing some entity in situ may never provide all the answers, but neither does parsing its pieces out so completely that the whole is lost. I am content to let Mondo do her thing, uninterrupted. You go, girl!